Paratha bread and fragrant rice. "Khasi ko maasu" Braised goat curry, slow cooked with Nepalese herbs & spices. "Chukauni" Yogurt & potatoes salad with sweet red onions, green chilies, fresh coriander & fenugreek flavoured oil. "Sekuwa "Classic Nepali Chicken skewers, marinated overnight with timur, nutmeg, lime zest & yoghurt. A charasmatic chef, whose food packs punch and personality. 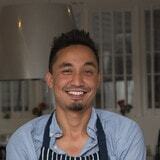 Rajiv's cooking will bring a smile to your face and his momos are moreish. Top night, top chef. Rajiv was delightful and his food delicious. Having a chef in one's own kitchen is not always easy as a stranger is in one's personal domain. Rest assured that Rajiv's engaging personality will put everyone at ease. The food was well cooked, just the right kind of spicy. The momos were a big hit with everyone and were served with a sauce that had us all licking out the bowl. Goat was slow cooked to a deeply flavoured spiciness and the yoghurt and potato salad is one of those dishes you wish you had the recipe for. There were second helpings for everyone - try getting that in a restaurant! Chef Rajiv was great. I really enjoyed the food and was quite surprised by the Chicken Momos,as I've never had them before. Everything was very tasty and I would recommend chef's food. Although I have to say, you must like spicy because Chef Rajiv likes to make his dishes spicy hot! Chef Rajiv created a wonderful menu for us to enjoy. He is a really engaging and charming chef, I loved how he explained how he achieved getting the authentic flavours in each dish. My favourite dish was the chicken momos served with a beautifully fresh chutney and the coconut ice cream was the perfect dessert to cool down the heat of the main course. I highly recommend him! Lovely food - beautifully spiced and carefully presented. Rajiv came with his own sous chef who was a great help. It also meant that he had time to explain the dishes to a very inquisitive group of food bloggers! Everything was left clean and tidy too. And, there was an extra welcome cocktail! My star dish would be the one that my guests have loved and enjoyed so far, which is Momos. Momos are Nepalese dumplings, served with tomatoes & sesame chutney. That and Goat curry! 1. Fenugreek seeds. They are a very versatile and tricky ingredient to cook with. They are mostly use to temper salad & achaar ( fresh pickle) without which a Nepalese lunch/dinner is incomplete. 2. Hemp seeds: I haven't seen them being used in any other cuisines so far. I love the texture and rustic flavour it brings to the dish. Mostly used to temper fresh pickle. 3. Garlic/Ginger/Tomatoes: Everyone's favourite ingredients. Without these three combination, a Nepalese dish is incomplete. I am the most happy in the kitchen. Being a chef is one of the most underrated jobs in the world but I love doing it because it gives you a great satisfaction when you put yourself on a plate. When people enjoy your food, the sense of happiness you feel is immeasurable. I enjoy the adrenaline you get when in the kitchen. My mother always say: " Cook from your heart and put your love & soul in everything you make." So being a private chef gives you an opportunity to spread the love"
If you believe this content violates or infringes your rights, Rajiv Pratap may not know. You could solve this problem by contacting him.